CBSE guide provides NCERT Solutions for class 12 physics has been solved by the expert and experience teachers of myCBSEguide. NCERT 12th class Physics book solutions are available in PDF format for free download. myCBSEguide provides you a complete solution of ncert solutions for all chapters of class 12 Physics.Students great to know about that maximum number of question asked from ncert books in board exam. These ncert book chapter wise questions and answers are very helpful for CBSE board exam and if students practice these NCERT Solutions they can get good marks in board exam. Especially for CBSE recommended NCERT books and most of the questions in CBSE exam are asked from NCERT text books. Class 12 Physics chapter wise NCERT solution for Physics part 1 and Physics part 2 for all the chapters can be downloaded from our website and myCBSEguide mobile app for free. Download NCERT Solutions for CBSE Class 12 Physics Electric Charges and Fields Class 12 physics subject Electric Charges; Conservation of charge, Coulomb's law-force between two point charges, forces between multiple charges; superposition principle and continuous charge distribution. Electric field, electric field due to a point charge, electric field lines, electric dipole, electric field due to a dipole, torque on a dipole in uniform electric field. Electric flux, statement of Gauss's theorem and its applications to find field due to infinitely long straight wire, uniformly charged infinite plane sheet and uniformly charged thin spherical shell (field inside and outside). Download NCERT Solutions for CBSE Class 12 Physics Electrostatic Potential and Capacitance CBSE class 12 Electric potential, potential difference, electric potential due to a point charge, a dipole and system of charges; equipotential surfaces, electrical potential energy of a system of two point charges and of electric dipole in an electrostatic field. Conductors and insulators, free charges and bound charges inside a conductor. Dielectrics and electric polarisation, capacitors and capacitance, combination of capacitors in series and in parallel, capacitance of a parallel plate capacitor with and without dielectric medium between the plates, energy stored in a capacitor. Download NCERT Solutions for CBSE Class 12 Physics Current Electricity CBSE class 12 subject physics download syllabus. Electric current, flow of electric charges in a metallic conductor, drift velocity, mobility and their relation with electric current; Ohm's law, electrical resistance, V-I characteristics (linear and non-linear), electrical energy and power, electrical resistivity and conductivity, Carbon resistors, colour code for carbon resistors; series and parallel combinations of resistors; temperature dependence of resistance. Internal resistance of a cell, potential difference and emf of a cell, combination of cells in series and in parallel, Kirchhoff's laws and simple applications, Wheatstone bridge, metre bridge. Potentiometer - principle and its applications to measure potential difference and for comparing EMF of two cells; measurement of internal resistance of a cell. Download NCERT Solutions for CBSE Class 12 Physics Moving Charges and Magnetism Class 12 Physics Concept of magnetic field, Oersted's experiment. Biot - Savart law and its application to current carrying circular loop. Ampere's law and its applications to infinitely long straight wire. Straight and toroidal solenoids (only qualitative treatment), force on a moving charge in uniform magnetic and electric fields, Cyclotron. Force on a current-carrying conductor in a uniform magnetic field, force between two parallel current-carrying conductors-definition of ampere, torque experienced by a current loop in uniform magnetic field; moving coil galvanometer-its current sensitivity and conversion to ammeter and voltmeter. Download NCERT Solutions for CBSE Class 12 Physics Magnetism and Matter Class 12 cbse physics subject Current loop as a magnetic dipole and its magnetic dipole moment, magnetic dipole moment of a revolving electron, magnetic field intensity due to a magnetic dipole (bar magnet) along its axis and perpendicular to its axis, torque on a magnetic dipole (bar magnet) in a uniform magnetic field; bar magnet as an equivalent solenoid, magnetic field lines; earth's magnetic field and magnetic elements. Para-, dia- and ferro - magnetic substances, with examples. Electromagnets and factors affecting their strengths, permanent magnets. Download NCERT Solutions for CBSE Class 12 Physics Electromagnetic Induction Electromagnetic induction; Faraday's laws, induced EMF and current; Lenz's Law, Eddy currents. Self and mutual induction. Download NCERT Solutions for CBSE Class 12 Physics Alternating Current Alternating currents, peak and RMS value of alternating current/voltage; reactance and impedance; LC oscillations (qualitative treatment only), LCR series circuit, resonance; power in AC circuits, wattless current. AC generator and transformer. Download NCERT Solutions for CBSE Class 12 Physics Electromagnetic Waves Electromagnetic Waves Basic idea of displacement current, Electromagnetic waves, their characteristics, their Transverse nature (qualitative ideas only). Electromagnetic spectrum (radio waves, microwaves, infrared, visible, ultraviolet, X-rays, gamma rays) including elementary facts about their uses. Download NCERT Solutions for CBSE Class 12 Physics Ray Optics and Optical Ray Optics: Reflection of light, spherical mirrors, mirror formula, refraction of light, total internal reflection and its applications, optical fibres, refraction at spherical surfaces, lenses, thin lens formula, lensmaker's formula, magnification, power of a lens, combination of thin lenses in contact, combination of a lens and a mirror, refraction and dispersion of light through a prism. Scattering of light - blue colour of sky and reddish apprearance of the sun at sunrise and sunset. Optical instruments: Microscopes and astronomical telescopes (reflecting and refracting) and their magnifying powers. Download NCERT Solutions for CBSE Class 12 Physics Wave Optics Wave optics: Wave front and Huygen's principle, reflection and refraction of plane wave at a plane surface using wave fronts. Proof of laws of reflection and refraction using Huygen's principle. Interference, Young's double slit experiment and expression for fringe width, coherent sources and sustained interference of light, diffraction due to a single slit, width of central maximum, resolving power of microscope and astronomical telescope, polarisation, plane polarised light, Brewster's law, uses of plane polarised light and Polaroids. Download NCERT Solutions for CBSE Class 12 Physics Dual Nature of Radiation and Matter Dual nature of radiation, Photoelectric effect, Hertz and Lenard's observations; Einstein's photoelectric equation-particle nature of light. Matter waves-wave nature of particles, de-Broglie relation, Davisson-Germer experiment (experimental details should be omitted; only conclusion should be explained). Download NCERT Solutions for CBSE Class 12 Physics Atoms Alpha-particle scattering experiment; Rutherford's model of atom; Bohr model, energy levels, hydrogen spectrum. Download NCERT Solutions for CBSE Class 12 Physics Nuclei Composition and size of nucleus, Radioactivity, alpha, beta and gamma particles/rays and their properties; radioactive decay law. Mass-energy relation, mass defect; binding energy per nucleon and its variation with mass number; nuclear fission, nuclear fusion. Download NCERT Solutions for CBSE Class 12 Physics Electronic Devices Energy bands in conductors, semiconductors and insulators (qualitative ideas only) Semiconductor diode - I-V characteristics in forward and reverse bias, diode as a rectifier; Special purpose p-n junction diodes: LED, photodiode, solar cell and Zener diode and their characteristics, zener diode as a voltage regulator. Junction transistor, transistor action, characteristics of a transistor and transistor as an amplifier (common emitter configuration), basic idea of analog and digital signals, Logic gates (OR, AND, NOT, NAND and NOR). Download NCERT Solutions for CBSE Class 12 Physics Communication Systems (Deleted) Elements of a communication system (block diagram only); bandwidth of signals (speech, TV and digital data); bandwidth of transmission medium. Propagation of electromagnetic waves in the atmosphere, sky and space wave propagation, satellite communication. Need for modulation, amplitude modulation and frequency modulation, advantages of frequency modulation over amplitude modulation. Basic ideas about internet, mobile telephony and global positioning system (GPS). NCERT Solutions Class 12 Physics PDF (Download) Free from myCBSEguide app and myCBSEguide website. 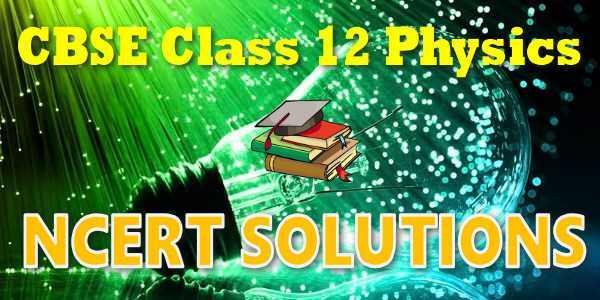 Ncert solution class 12 physics includes text book solutions from both part 1 and part 2. NCERT Solutions for CBSE Class 12 Physics have total 15 chapters. Class 12 Physics ncert Solutions in pdf for free Download are given in this website. Ncert physics class 12 solutions PDF and physics ncert class 12 PDF solutions with latest modifications and as per the latest CBSE syllabus are only available in myCBSEguide.